What is inside cushions is as important as whats on the outside. Many people judge a cushion by its cover, but that is not the only thing to consider if comfort and durability are a factor. Tufted and foam cushions are the two most common types of cushions used for casual furniture. Tufted cushions are filled with polyester fiber while foam cushions are filled with solid foam or solid foam wrapped with Dacron. Tufted cushions have the top and bottom panel of the cushion sewn together with sewn circle tufts which hold the fiber from shifting and give the cushion its unique appearance. The more tufts in the cushion the thinner the cushion. Firmness or softness is based on a combination of the number of tufts and the amount of fiber filler used. Quality tufted cushions will be filled sufficiently that the cushion hold its shape and feel comfortable for a long time. Stay away from any tufted cushions that don’t use 100% polyester fill. Otherwise, they will probably break down too quickly and not feel comfortable after being used only a short time. Foam cushions provide good support and have a flat surface unlike tufted cushions. Although some manufacturers use solid foam, many wrap a one inch layer of Dacron on the top and bottom surfaces of the foam. This provides a little softer feel to touch to the cushion and it makes the fabric cover look smooth on the surface. The thicker the foam the better they feel. 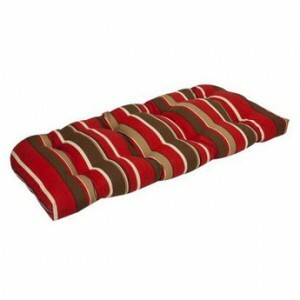 Foam seat cushions can be found in a range from two inches up to eight inches thick. Three and four inch thick foam cushions are generally a pretty good choice. People who weigh over 180 pounds and appreciate a decent cushion should consider a minimum of a four inch foam cushion. Some companies use more than one inch of Dacron wrap around the foam. If you can open up the cushion and look inside and if there is more Dacron than foam, don’t buy it. You will probably be sorry by the end of the summer because your cushion will probably be misshapen and flattened out. Foam cushions can be manufactured from foam with different densities. Choose cushions made from medium or high density foam. When shopping for cushions, whether you are looking for tufted or foam cushions, consider how they feel and try to determine what materials are used inside. Look for 100% polyester fiber filled tufted cushions that have sufficient filling to ensure comfort and they keep their shape. Choose foam cushions with one inch or less of Dacron wrapping with medium or high density foam. Following these guidelines will help ensure you choose cushions that will feel and look good for a long time.